The new National Memorial for Peace and Justice opened in Montgomery, Alabama on April 26, 2018. It stands as a reminder of the many acts of discrimination against African Americans over the course of American history, and in particular memorializes over 4400 documented lynchings that occurred between 1877 and 1950. 800 rectangular iron blocks hang several layers deep in rows around a square. Each block contains the name of a county and state where lynching occurred, as well as the names of the victims and the dates they were lynched. Some contain the name of just one victim, others contain dozens. My husband, son, and I visited the memorial last week. The monument looms large atop an elevated earth mound. We walked past a sculpture of life-sized bronze figures in chains, and up the path from the entrance. The wall to our right got shorter as we climbed to the level of the memorial. The wall to our right got shorter as we climbed to the level of the memorial. We should have been climbing out of slavery and into freedom, but instead were confronted by the sea of iron blocks. The first ones we approached were set on the ground. At six feet tall, they approximate the height of a person. At the next corner of the monument, a path leads downward. Blocks incised with county, state, and names of people who were lynched there. We turn a corner and descend. The iron blocks hang around us. The blocks in the first row are marked with counties in Alabama, each deeper row listing counties in other states and their victims. We couldn’t figure out how the inscriptions are ordered, so we asked one of the guards. He explained the blocks are arranged alphabetically by state and county in a spiral that starts in the outside row, goes all the way around the square, and then continues through each successive row ending with the most interior blocks. As we walked downward, the blocks became suspended from iron poles. By the time we reached the bottom, they loomed above us, eerily echoing the hanging victims they document. On either side of this below-ground passage, signs describe the circumstances in which people were lynched—for frightening a white child, or asking a white man for money they were owed, or for “standing around” in a white neighborhood. On the lawn outside the monument, we walked by a second set of blocks, twins of the ones hanging in the memorial. Laid on their side as they are, they resemble coffins. The intent is for counties to claim the block with their name on it and to each set up their own memorial site. Over time, as such monuments proliferate, more and more gaps will appear in the blocks resting on the lawn. In effect, the memorial will become a network of sites mapping the places where lynching occurred. Duplicate blocks await placement in the counties where lynching occurred. Clearly, parallels can be made between the National Memorial for Peace and Justice and sites throughout the world memorializing the Holocaust. Rather than commemorating moments of national pride, they compel us to remember our failures. It doesn’t matter that I wasn’t born when these events took place. I’m an American, and proud to be one. And it is because of that sense of connection to my nation that I feel a sense of responsibility for what happened in my country, for the injustices that Americans perpetrated against other Americans. Even if I weren’t American, if it weren’t a failing of my nation, of people with whom I share a national affiliation, I would feel guilty—as a human being. Like I feel guilty that the Holocaust ever happened. It was a failure of humanity, of empathy that is only conceivable in its monumental horror because it actually occurred. That’s not the entire truth. The fact is that, as a person of Jewish descent, I identify with the group that was victimized in the Holocaust. As a person of European descent, however, my group was responsible for the victimization of people of African descent. This shift in perception, from victim to victimizer, is a difficult one. And the harm caused by racial bias and discrimination continues. “Raise Up,” sculpture by Hank Willis Thomas at the Peace and Justice Memorial. Represents continued racial bias and discrimination by the criminal justice system. Several blocks from the Peace and Justice Memorial, the Equal Justice Initiative’s Legacy Museum further highlights racial injustice in the United States. One exhibition has left me with a nagging feeling of distress, maybe because of uneasy associations with current conflicts about the highest courts in both the US and in Poland. A single illuminated display summarizes all of the US Supreme Court’s rulings that address racial justice issues. Alongside the decisions most often discussed and celebrated, like expanding the right to vote and defending equal access to education, are many more that maintained or reinstitutionalized discriminatory practices. I didn’t know how complicit the Supreme Court has been in perpetuating injustice, but there it was made visible right in front of me. For a brief period right after the Civil War, African Americans gained the right to vote and were elected into political offices. But then, Jim Crow laws imposed poll taxes and literacy tests that kept them from voting, and enforced segregation in businesses, buses, and public institutions. With one decision after another, the Supreme Court upheld such discriminatory practices, and whittled away at the rights of freed people of color. The 1896 Plessy vs. Ferguson ruling, in which the Supreme Court defended the constitutionality of segregation as long as African Americans had “separate but equal” facilities, is only the most well-known of many decisions upholding segregation and discrimination. We like to see ourselves in a positive light. We identify more with Brown vs. The Board of Education than we do with Plessy vs. Ferguson. We celebrate the Civil Rights Movement, but shy away from a deeper acknowledgement of the harm inflicted by slavery, discrimination, and deeply entrenched biases. There is still a lot we need to come to terms with. I’m glad to see this new museum and memorial taking steps in that direction, and that they are in my adopted state of Alabama. Mama called him “przystojniak,” “handsome guy.” But who is he? When I asked mom who the handsome guy was, though, she didn’t know. I wonder if it might be one of her mother’s brothers, perhaps Abraham/Jon Piwko who came to the US long before mama was born. It would help if I could pinpoint the year in which the photo was taken. His clothes provide some hints–the short, wide tie, the jacket pocket, and the cuffed pants. Still, I don’t know enough about historical fashion to figure it out. Looking back and forth between the two photographs, I can’t tell if it’s the same person or not. These photos were in the envelope my grandmother labelled “Do Not Open.” She didn’t want us to know about our family history because she didn’t want us to know our ancestors were Jewish. One other photo in that envelope depicts a young girl. She stares at the camera with assurance, a charming smile revealing her dimples. Long curled locks reach down to her waist. She holds a telephone to her ear, tilting her head down toward the hand-held earpiece. A cousin has identified her as Abraham’s daughter Paulina Piwko, the older girl in the group photo above. Again, clues to the date of the photo should be in the clothing–the white lace-up boots worn with knee-high stockings held up with garters, the pleated white dress reaching just above the knee, with a frilled collar and pleated short sleeves. Again, I don’t know enough to be able to read these clues and pinpoint the date the photo was taken. If this is Paulina, she would have been a little older than in the group photo. If she is 10 in this photo, it was taken around 1913. My cousin Krysia has remarked on how much this looks like our grandmother. And I agree. 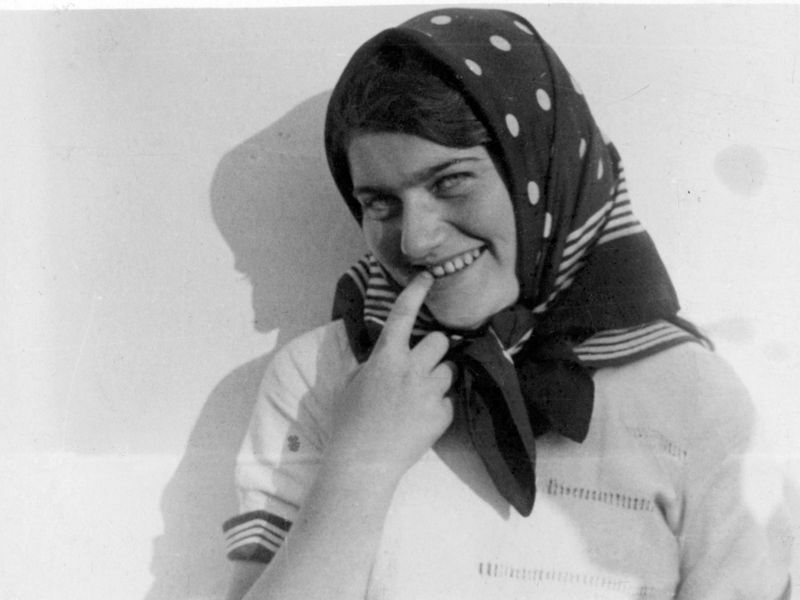 Babcia also had dimples, thick, long hair, and the kind of charm that seems to radiate from the girl in the picture. If it were Babcia, that would mean this photo was taken around 1904. Candlestick phones like this were in use from around 1890-1940, so that clue doesn’t narrow things down enough to confirm or rule out either possibility. Still, my cousin, a descendant of Abraham, knows this photo and recognized it as his great aunt Paulina. Why would he have seen a picture of my grandmother? Why would it have been among the photos that were passed down in his line? Here’s a fantasy explanation–one I have no evidence for outside of the photographs themselves. Could the photos of the handsome fellow and the charming girl have been taken at the same time? Might the siblings have wanted photos of each other when the older brother went away the America, never to return? It’s a long shot, but it would make a good story.